Cementos Weld-On para plomería - Weld-On Adhesives, Inc.Weld-On Adhesives, Inc. The full line of Weld-On Plumbing Cements is built on our 60+ year tradition of excellence to assure the reliable performance you’ve come to expect from the Weld-On brand. 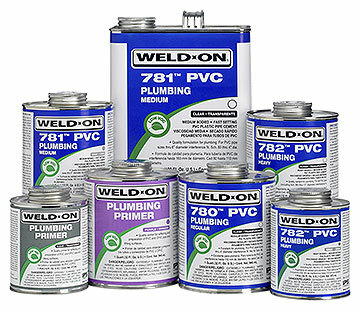 Weld-On Plumbing Cements, Primers and Cleaners are formulated for easier installation as well as improved installer safety and comfort. Low odor, low VOC Plumbing Cements are environmentally friendly. To view the full line of Weld-On Plumbing Cements, please click the link below to be redirected to the IPS Corporation website.